Median line, also known as Andrews’ Pitchfork tool is a great tool to help in your trading, especially if you are a price action aficionado. Median lines are nothing but trend lines which are divided into two parts and can offer some unique insights when applied correctly. Although Median line trading is easy, it takes a bit of time and practice to correctly figure out where to trade and more importantly how to trade. There are many articles on the web that will introduce you to median lines or Andrews’ pitchfork. Therefore, this article will not go into the details of the basics but in fact introduces you to a unique way to trade with median lines. Median lines are plotted using a low – high – low on a consecutive pattern, which usually results in a rising median line. Likewise, when you connect pivot high – low – high you get a falling median line. 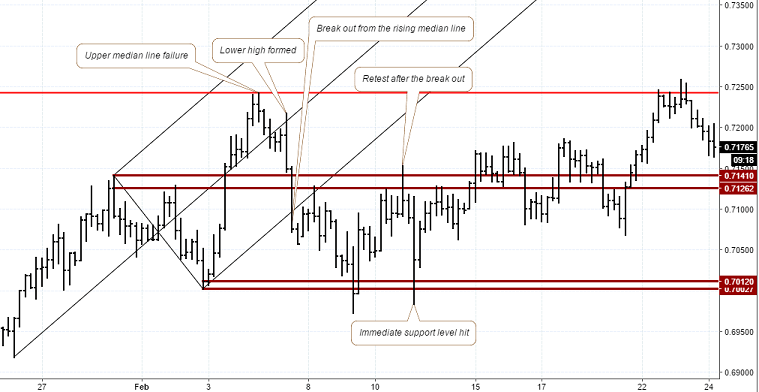 Break out trading can be a great way to use median lines. Therefore, you look for short positions on a rising median line when prices breakdown and you look for long positions when prices break out from a falling median line. When plotting the median lines, a bit of subjectivity is involved to ‘tweak the set ups’. Because we are only interested in trading break outs, we have the advantage of ‘fine tuning’ the median line so that price action will validate the median lines. This is best illustrated in the following example. The chart to the left uses the conventional way of plotting the median line. You pick the pivot high, low and high. While it is right, there are subtle price action clues that are missing. The right side of the chart shows the same median line with an adjusted pivot high. You can instantly notice clues such as the dip on the right touches the median line before reversing, while the price high marked by the down arrow shows a touch to the median line. As you can see from the above, with a bit of practice and using price as clues, you can adjust or tweak your median lines to plot them correctly. 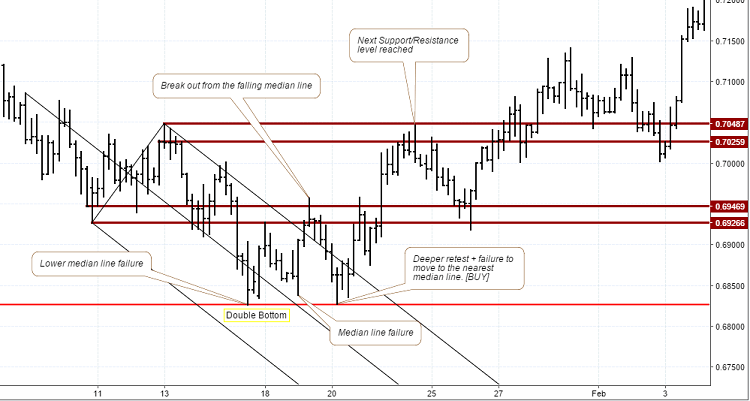 The pivot levels that you use to plot the median lines are in fact support and resistance levels. To plot these levels, draw a horizontal line near the pivot high and the nearest close. Plot these levels for the three pivot levels as well as mark the recent low (or high in case of a rising median line). With the support and resistance lines now plotted, we are ready to trade the levels. There are just two simple rules to bear in mind. The above rules can be further validated by a Median line failure. A median line failure is where prices fail to close at or miss the nearest median line. In the second chart above, notice how prices failed at the median line, by only making a low before closing higher. This was subsequently followed by another low which broadly missed testing the median line. When the above rules are qualified, buy at the support or sell at the resistance. Target the next immediate levels. The above breakout example with median lines shows how you can use the median line tool and trade the breakouts more effectively. This approach offers a higher level of probability compared to trading breakouts just with trend lines.